The thyroid is a butterfly shaped gland that regulates metabolism and energy levels. This sounds like no big deal until it stops working. I know because my thyroid has lately decided to call it quits. My nurse practitioner had never seen thyroid lab values as out-of-whack as mine. One of those tests, the TSH, should be between 0.36 and 3.74. Mine was 69.5. She’s not sure how I was functioning at all. I guess she doesn’t know how stubborn I am. Since being diagnosed with hypothyroidism I have met many other people with this problem. According to the NIH, 4.6% of the US population 12 years of age and older have hypothyroidism. This is a diagnosis that affects not only the patient, but also the other people in the patient’s life. I didn’t even know that I had a problem because the symptoms developed so slowly. I got so used to feeling awful that I thought it was normal. Soon after my diagnosis, before treatment began to have an effect, I wrote a description of what I felt like. In order to help understand how it feels to have an underactive thyroid, I will share below some of my symptoms and what they felt like to me at that time. If you are experiencing these symptoms, please see your doctor and don’t let it get as extreme as mine was. Fatigue – This is a bone-deep weariness, unrelieved by sleep. My body is using every resource just to make my vital organs work. There’s none left for unimportant things like, say, energy or ambition. Something simple like grocery shopping or walking to a single store in the mall exhausts me for the rest of the day. Increased sensitivity to cold – I am like our lizard looking for the warmest spot to soak in some heat. Last Christmas I sewed bags of dry rice for family members to warm in the microwave and use as heating pads. I also made myself a large one, and it has become my best friend. I pile on the covers in bed and still wake up cold after several hours of sleep. Unexplained weight gain – This one is very simple. If I don’t diet, I gain weight. If I diet, I gain weight anyway. I could eat anything or nothing and still gain weight. Just as my metabolism only has enough energy for my vital organs, and none for ambition or energy, I’m also not burning as many calories as I normally would, so I gain weight. They tell me that once my thyroid medication kicks in and my blood levels are normal again, I will feel better in many ways, but the weight I have gained will not leave in the same easy manner that it arrived. However, if I work at it, I will be able to lose weight, which is more than I can do right now. Muscle weakness – Did I mention that five minutes on a stationary bike feels like I just ran a marathon? Pain, stiffness or swelling in your joints – When I get up in the morning, my joints feel like I am about 30 years older than I am. I take steps one at a time. Thinning hair – With all the hair I gather off the bathroom floor after I brush my hair, I’m surprised I have any left on my head. What I do have left on my head is very brittle and has all the smooth texture of straw. Slowed heart rate – Normally a slow heart rate is good, but in this case it is not. Problems concentrating – “Brain fog” is a term used for this symptom because it feels like that thought is just beyond your grasp and you can’t quite reach it. It’s right there…almost. I estimate that my IQ is probably about 2/3 of what it used to be. Low body temperature – 98.6 is never reached. Remember that part about the lizard in the sun? Depression – I wouldn’t call what I feel depression as much as I feel apathy. It’s just been very hard to get motivated to do anything. But I guess this one could be a lot worse. It’s not too extreme. Impaired memory – I need to make a list of the lists I make. I have always been forgetful and air-headed, but lately I’ve taken it to a whole new level. The other day I drove somewhere and literally forgot which route I took. My husband tells me things, and not only can I not remember what he said, but I have forgotten the entire discussion, never to be remembered again. Until I figured out that my thyroid was low I was concerned that maybe I had Alzheimers. I love to watch kids with their grandparents. It doesn’t make sense. You see, by kids’ normal standards, grandparents should be very uncool. Their clothes are not the “in” name brand, and their cars are usually more practical than sporty. They don’t know all the latest hip phrases, and their music selections are more oldies than cutting edge. Even during their teen years, when their parents have suddenly lost all their smarts, kids make an exception for their grandparents. It doesn’t matter that their knowledge of who’s who is decades out of date: they are still awesome. Take my own grandparents for example. My maternal grandfather was named Arvey Stafford (yes, ARVEY, not Harvey, not Avery, not R. V.), but everyone called him “Pete” or “Uncle Pete”. He died when I was pretty young, so I don’t have too many distinct memories of him, though I know he loved his grandkids and thought we were pretty near perfect. 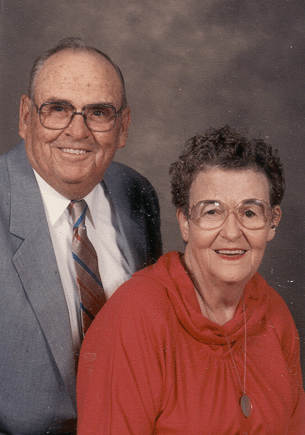 He said once, “I’d know if I had any ugly grandkids.” My maternal grandmother, Ollie Mae Hurt Stafford died when I was almost 28, so I have a lot of memories of her. She had 7 grandchildren, but I was the only girl among them, so she thought I was extra special, or so she made me think. She didn’t live in a big house or have much money, but ah, the example she set. Following is a piece I wrote and read at her funeral that pretty much sums up what I remember about her and the good times we had at her house. We didn’t have high-tech toys, but we sure did have fun! I remember baby quilts and big quilts, star quilts, and dutch doll quilts and tacked quilts. I remember embroidered pillows with squirrels and birds and deer and mushrooms. I remember your garden. Every year you said, “I’m not gonna make such a big one next year”, but you always did. I remember playing cars in the dirt under the big elm tree at the old green house. I remember you were always “Aint Ollie” and Joey would say “If she ain’t Ollie, who is she?” but no one ever answered. I remember blackberry cobbler and peanut butter cookies. All the little kids who ever lived around you knew about those cookies too. I remember that I never heard you say a bad word about anybody. I remember toast fixed in a black iron skillet and coffee fixed in boiling water on the stove. I remember your “smokehouse” with potatoes on the floor and your wringer washer that you used. The tornado took the smokehouse and washer and chickens and roof and who knows what else. You got a new shed and it was still the smokehouse, never the shed. I remember you loved your church and the people there. You always went to church and never made excuses. You even went and helped make pizzas and peanut brittle even if your knees made you sit down to work. I remember Kick the Can and Hide-N-Seek and that old red wagon. Since I was the lightest, I always got to ride. I’d hold the tongue and use it to steer and the boys would get behind and push just as fast as they could. I’d fall out, of course, but then get back in and go again. They’d also pull me on the driveway and see how far over the ditch they could hang before I’d fall out. I always did fall in that muddy ditch, and then we’d do it again. I remember you mowed that big lawn into your 80’s. Not because nobody else would, but because you wanted to. I remember you always hummed and sang. I remember you always had a tan, and not from a tanning booth. You had a green thumb that could make anything grow, and you loved being outside. All the pieces to your quilt are cut and pieced and stitched together and quilted now. All my memories are only a section of your quilt. Everyone here could tell stories if we had the time. You’ve done beautiful work, touched many lives, and put together some great memories. 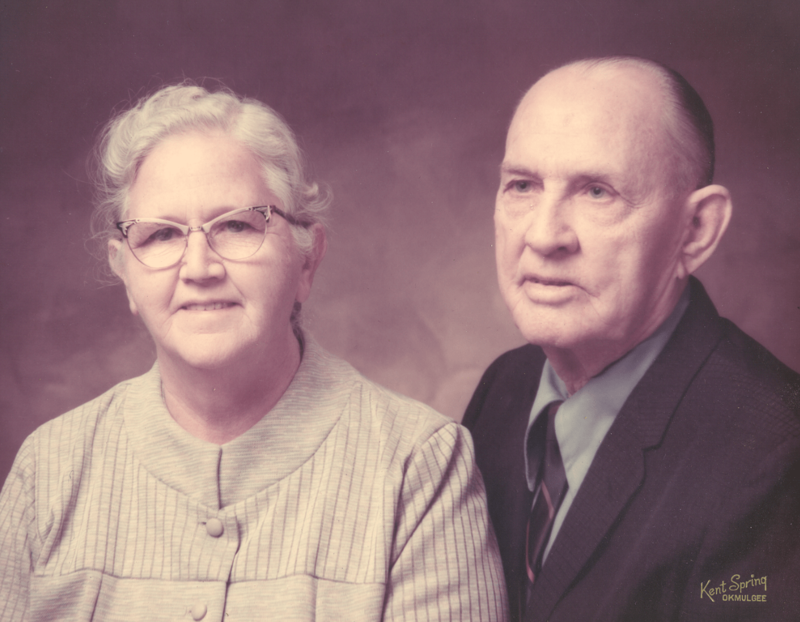 My paternal grandparents, Roy Lee Moss Sr. and Pearl Cutrell Moss (she had another first name which she hated so much that I won’t put it here), were also amazing. They lived far away from us, in Monahans, Texas. If you’ve never been to Monahans, you’ve missed it. 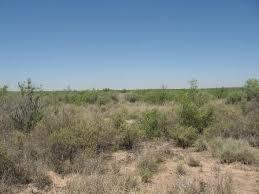 You’ve missed mesquite, the low bushy kind that doesn’t grow very high because there’s just not enough water. 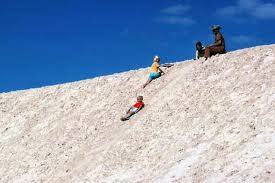 You’ve missed sledding down the sand hills at Monahans Sandhills State Park. Did you know it takes several days to get sand out of your hair after a day of sand sledding? Well, it does. 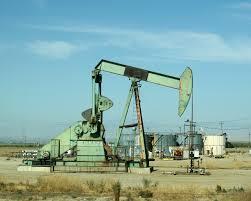 You’ve missed pumpjacks popping up out of the earth like mechanical aliens that might be trying to take over the world. You’ve missed going out in your bare feet and stepping on “goad head” stickers. Ouch! So why would anyone want to go to such a deserted (literally, desert-ed) place? The answer for me was that there was love there, and a heaping lot of it. Grandma loved to shop, especially for gifts to give us grandkids. Christmas was a-ma-zing. She always made sure that all 5 grandkids had the same number of presents. We knew because Jessica always counted. Looking back on it, I can see that she was actually very sick. She had horrible rheumatoid arthritis. 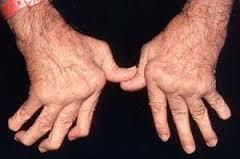 Her hands looked a lot like this. I can’t imagine walking any distance at all on her feet. She had a surgery that basically fused all the joints in her feet together. It was supposed to help her, but it sure didn’t look like it. Instead, it made her very prone to falling. She was on blood thinners that made her bruise horribly. My grandfather had to help her up out of any chair, and he had to be very careful about it because she would get the most horrible black and blue bruises from just a bit of pressure on her skin. She had lost an eye to a combination of glaucoma and a bad doctor, so she took her glass eye out every night and kept it in a cup by her bedside. This was strange and wonderful and not at all gross because it was part of who Grandma was. 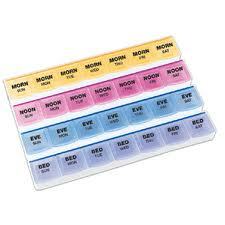 Her pill organizer looked something like this, but hers was so full that she had several rubber bands around it to keep it from overflowing and the pills falling out. I say all this to reinforce the statement when I say that I never once heard her complain. She would occasionally sit down on a bench when we went to the mall, but then she’d get up and keep right on going. She died of ALS, also known as Lou Gehrig’s Disease, but nobody diagnosed it until a few days before her death, so she had quite a bad time, especially along the end. But she kept right on going. Grandma and Grandpa didn’t know many cool phrases. Theirs included getting something out of the “boot” (we called it a trunk) of the car, and Grandpa saying “I think I’ll turn in” at bedtime. If Grandpa had heard me use the word “gross” just a few paragraphs back, he would have reminded me that a gross is actually a number meaning 144. Grandpa was a deal-maker. He could make money off of just about anything, but we used to tease him about how he was always “losing” money. You see, if he bought something for $1000, tried to resell it for $2000, and ended up selling it for $1800, he said he had “lost” $200. So to talk to him, he was going broke very rapidly. He was a man of integrity and hard work. His skin was the color and texture of leather from working in the oilfields for years on end. He didn’t have much use, or maybe any use at all, for someone who wouldn’t work. No job was too menial or hard for a good man. He was kicked out of the house, due to no fault of his own, by his moonshiner father for his 16th birthday, in Oklahoma in 1932. That was Dust Bowl country in the middle of the Great Depression. He washed dishes, rode bulls, and whatever else he could find to keep body and soul together and still went to sleep hungry plenty of nights. Having been through that, he didn’t have much respect for people who wouldn’t do a job because they thought they were above it. He loved his family. If something needed to be made, he would make it. Evidence of his welding skills were everywhere around the house. There was the painted red metal high chair he made when my dad was a baby. There was the swing set in the back yard that he made. It was very tall, or at least it seemed so at the time, giving its passengers a very nice high arc (though you didn’t dare jump off of it into the grass; remember those goat head stickers?). There were sheds, buildings, cow pens, feeding troughs, corrugated metal roofs, and whatever else this modern day blacksmith could construct that was practical. For he was always practical. He was an amazing nurse to my grandmother. He tried to keep things light even through hard times. He would joke with her and they would laugh at circumstances that weren’t really very funny. And his grin was infectious. He loved to tease us kids, telling us that all those Christmas presents were for him, or they were full or rocks, or whatever else he could say to get a rise out of us. Grandma liked western and country music. She made mix tapes for me using her stereo, 8 track tapes and records. Us grandkids would occasionally crank up the Oak Ridge Boys and sing “Elvira” (click that title if you want the full effect) at the top of our lungs. You know, “Giddy Up-a Oom Poppa Omm Poppa Mow Mow, Giddy Up-a Oom Poppa Omm Poppa Mow Mow, Heigh-ho Silver, away”. Any teen would have been laughed out of class had they admitted to doing this, but it was okay because it was at Grandma’s. So, by teen standards, all my grandparents were way out of date, out of touch, and totally uncool. The cars they drove were very practical and never new. Grandma Stafford never learned to drive. Grandpa Stafford drove a truck which would now be considered a classic, but then it was just old. Grandpa Moss drove a truck, sometimes a welding truck, sometimes just a pee-cup truck (as he used to call it). Grandma Moss drove a used sedan; I’m sure that Grandpa got a good deal on it. Their clothes were decent and clean but designed more for comfort than style. 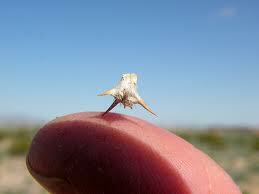 Grandma Stafford went barefoot every chance she got, as evidenced by the calluses on her feet. Her work shoes had holes cut out of them in the toe region to accommodate her gouty toes. Grandma Moss loved her SAS granny shoes because they helped her painful feet. I am sure I saw Grandpa wear something besides cowboy boots, but if I did, I don’t remember it. And all that was just fine with me. So you see, my grandparents were very uncool. But to me, they were the best. Somehow they were held to a different standard, and that was okay with all of us. Why? Because there was love, and a heaping lot of it. Before Sunday evening prayer service, one our ministers allows people to share prayer needs with the congregation. 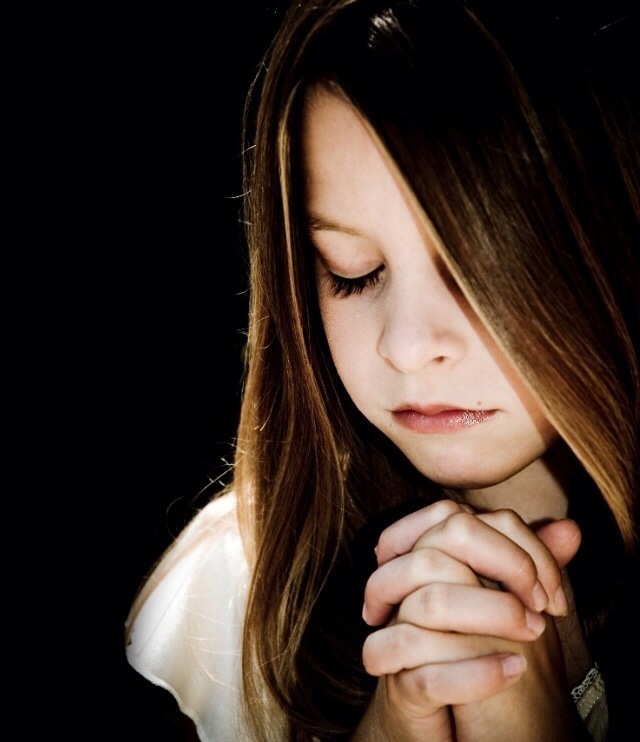 We allow, even encourage, our children to speak their requests. My 2 daughters always name the same things: my older daughter’s skin condition and my chronic headaches. I am told they also name these same requests every Wednesday night in their Kids’ Bible Night classes. So what’s the point? The point is that we need to say it for our own sake. We need to be reminded of all of those things. We need to exercise our faith, continuing to trust Him for our needs. We need to include God into our lives. We probably want to verbalize it a little differently, but “the same old same old” is not necessarily a bad thing. What If The Preacher Acted Just Like You ? My kids occasionally make the mistake of saying that they have to help out with something around the church or act a certain way because they are The Pastor’s Kids. They have learned that this is a bad idea because it rapidly earns them a lengthy lecture about how they are actually doing it because they’re an important part of the church, a contributing member, and a part of the body. It wouldn’t matter if they were a plumber’s kid or a doctor’s kid. If they are Christians then they are important, they should contribute, and their actions matter. Every member of the church body should be an integral, important, contributing part. So here’s a simple question everyone should ask themselves. What if the pastor acted like you? 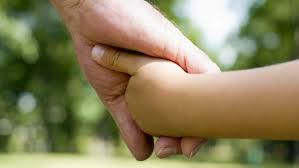 What about the pastor’s spouse and children? If they walked into service at the same time as you, would that be okay? Would the service start on time? If they missed as many services as you, would it hinder the congregation in any way? How about if they used your criteria to decide what constitutes a family emergency or a reason to keep the family home. Would things continue on at a reasonable level? On Sunday morning, if their focus, intensity, attitude, and worship were like yours, would that be okay? How about involvement in activities? If they attended as many special events and extra meetings as you, could things go on as they should? And giving. If the ministers of the church gave the same percentage of their income as you, what would happen? Would the lights go off and the missions commitment remain unfulfilled, or would things continue to hum along undisturbed and maybe even grow and improve? What if the members of the pastoral team dressed like you? Spoke of others like you? Loved like you? Greeted visitors and new members like you? Trained their children like you? Prayed like you? You see, since we are all children of God, equal at the foot of the cross, we are all responsible to act like children of God. The Bible doesn’t lay out a hierarchy of who is most important, who owes the biggest commitment, or who can sin a little more than others. No, we are all to be called, chosen, and faithful. So my goal is that my children, when they are no longer The Pastor’s Kids, will continue to minister in some way no matter what their occupations. It might be in the form of praying for others and helping the needy, changing toilet paper rolls and picking up trash, having consistency in attendance and financial giving, or preaching a sermon and playing an instrument. Whatever the case, I hope they never drive by a piece of trash on the front lawn of the church without instinctually stopping to pick it up because they are really that important!